Most 1950s science fiction films are, let’s face it, pretty cheesy. In The Blob, a jello-mold creature absorbs a town. In Attack of the 50 Foot Woman, a very tall woman (in the days before the WNBA) attacks a town. And in Rocket Ship X-M, Lloyd Bridges attempts to seduce every woman in an intergalactic town. But perhaps the worst science fiction movie of all time, and a contender for the worst movie of all time, was Plan 9 from Outer Space, where extraterrestrials team up with vampires to (you guessed it) oppress a small town. An exception to this lame fare was 1956’s Invasion of the Body Snatchers. Unlike the others, Body Snatchers did not rely on rubber monsters or flying saucers dangling on strings. Instead, it played on the basic fear of having our identity, our “self,” stolen. In doing so, it hit on a theme as old as Faust and as contemporary as yesterday’s “evil twin” storyline on Days of Our Lives. The hero in Body Snatchers is Dr. Miles Bennell, the only doctor in a small American town. After returning from a vacation, he discovers that some of the townspeople, despite appearing normal in every other respect, are emotionless and somehow lacking what makes them human. Eventually, Miles discovers the truth—that plant-like pods from outer space have fallen to earth. One by one, the pods have duplicated the appearance of the townspeople as they slept and taken over their identities. Who is human, and who is not? Who can be trusted? Before long, Miles is the only human left in town. Miles finally escapes and is taken to a hospital, where he is thought to be insane. The movie ends with his telephone call to the FBI. The question of whether his story will be believed by the “authorities” is never truly answered. Does such a plot sound like pure fiction? Ask Ross Perot, Warren Buffett, Ted Turner, David Geffen, Tony Gwynn, George Lucas or Oprah Winfrey. They are among the victims of a new breed of criminal called the Identity Thief. The ID Thief is not out to steal your car, your jewelry or your cash. He is out to steal you. 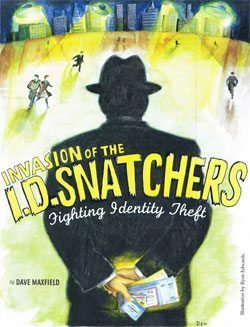 The ID Thief operates by assimilating enough of your personal identifying information to be able to convince banks, merchants and creditors that he is you. Where does the ID Thief get this information? Think through your typical day. You write a check to the grocery store. You call home on your cell phone. You charge a video rental. You pay bills, apply for a new credit card or mail your tax return. Each of these transactions requires you to disclose information about yourself—your name, your address, your telephone numbers, your driver’s license number, your date of birth, your income or your social security number. This information can be collected by pick-pockets, mail thieves, phone scam artists, ex-spouses, neighbors or the dishonest employee of any business you have transacted with (or are employed by). It can be purchased on the Internet for less than $50. This information may even be found in your trash can by a “dumpster diver” if you fail to shred your records (although having two kids in diapers at home is a potent deterrent). When an ID Thief obtains your personal information, he can put it to work in two ways. First, he can use your existing accounts to purchase goods or get cash. He can keep you from finding out he has done this by changing the billing address on these accounts or bank statements. From then on, the bills and statements will come to an address other than yours (where they will be politely ignored). Secondly, the ID Thief can use your personal information to open entirely new accounts—as you, of course. Typically, these will be new credit cards. However, the only limits are the ID Thief’s creativity and nerve. For example, ID Thieves have been known to finance purchases as small as a cheap diamond ring and as large as a decked-out Lincoln Navigator. Truly inventive ID Thieves have used the personal information of others to apply for jobs, avoid criminal prosecution or even file bankruptcy. Pay attention to the billing cycles of your accounts. If your September/October bill or bank statement does not arrive on time, it could mean that an ID Thief has taken over your account and changed the address to cover his tracks. Guard your mail. Do not let sensitive outgoing mail sit unattended. It is safest to deposit payments and other correspondence that contains personal identifying information in a post office collection box. Hold incoming mail while on vacation. Do not reveal any personal identifying information without knowing exactly how it will be used and whether it will be kept confidential. Never reveal it on the telephone. Watch your social security number! Do not carry your card in your wallet or use your number as an identifier (e.g., on a driver’s license) except where absolutely necessary. Check your credit report from the three major reporting agencies (Equifax, Experian and Trans Union) at least once a year. Make sure they include only your actual accounts and are otherwise accurate. Shred your sensitive documents before throwing them away. As stated above, ID Thieves typically will divert account statements from the rightful owner’s mailbox. As a result, most victims of identity theft first learn of the crime when they are contacted by a debt collector about their “delinquent” accounts or denied credit because of negative information in their credit report. Help! Someone has obtained credit cards in my name and charged over $20,000. The credit card companies have turned the accounts over to collection agencies. Neither the companies nor the agencies believe that I didn’t authorize the accounts. I had no idea any of this was happening until I applied for a mortgage. Because these “bad” accounts showed up on my credit report, I didn’t get the mortgage. How do you help clients like Ben? Calm the client’s fears. Many people in Ben’s situation believe that they are liable on the fraudulent debts. Some are told this expressly by debt collectors. They may fear jail or insolvency. Reassure them that, in most cases, legal liability is small or nonexistent. There is, for example, no liability for new accounts opened fraudulently without the client’s authorization. For the unauthorized use of existing credit accounts, the Federal Truth in Lending Act, 15 U.S.C. §§ 1601, et. seq., via the Fair Credit Billing Act found at §§ 1666-1666j, limits liability to $50 per card. For unauthorized use of debit or ATM cards, liability is also limited by the Electronic Funds Transfer Act to $50 unless the consumer fails to report the loss within two business days, 15 U.S.C. §§ 1693-1693r. Then, liability can be up to $500. If the consumer waits more than 60 days, there is no limit on liability. Finally, in most circumstances, the consumer will not be liable for forged checks unless he fails to take reasonable care of his account or notify the bank in a timely manner. See S.C. Code Ann. §§ 36-3-406, 36-4-406 and 36-3-419. Have the client report the crime to law enforcement. While the ID Thief may never be caught, having a police report in hand is helpful in verifying to creditors, credit reporting agencies and debt collectors that the account was opened by fraud. The Identity Theft and Assumption Deterrence Act, enacted by Congress in October 1998 (and codified, in part, at 18 U.S.C. § 1028) is the federal criminal law directed at identity theft. Federal law enforcement agencies like the U.S. Secret Service, the FBI, the U.S. Postal Inspection Service and SSA’s Office of the Inspector General investigate violations of the Act. Federal identity theft cases are prosecuted by the U.S. Department of Justice. South Carolina’s relevant criminal law is the Financial Transaction Card Crime Act, S.C. Code Ann. § 16-14-10, et. seq. Contact creditors immediately and in writing. You should send a certified, return receipt letter to the creditor (and any fraud department maintained by the creditor) advising that the account was opened or used fraudulently and is disputed by the client. Get the debt collectors off the client’s back. The Fair Debt Collection Practices Act, 15 U.S.C. § 1692, et. seq., restricts debt collectors from using oppressive, unfair or deceptive practices in connection with the collection of consumer debt. The South Carolina Consumer Protection Code applies some of these restraints to the creditors themselves. See S.C. Code Ann. § 37-1-301(28). Debt collectors may not continue to contact consumers if advised in writing that the debt is disputed, unless the collector sends written proof that the debt is owed. Contact the “big three” credit reporting agencies. This contact is critical for two reasons. First, it can prevent the client from being the victim of further fraud. Secondly, if not addressed, the false negative information in a client’s report can cause further credit denials. It may, for instance, cause the client to be unable to buy a house. Request, or have the client request, that a “Fraud Alert” be placed in his file. Also request that a consumer statement be added to the credit file indicating that no credit should be issued unless the client is contacted and personally approves it. All fraudulent accounts should be disputed. The Fair Credit Reporting Act, 15 U.S.C. § 1681-1681t, provides procedures for correcting mistakes in consumer credit files. Under the FCRA, both the credit reporting agencies and those who furnish information to them (such as banks or credit card providers) are responsible for correcting inaccurate information in the report, 15 U.S.C. §§ 1681s-2(a)(1)(b) and (a)(1)(c). Typically, the dispute procedure is initiated by filling out a “Reinvestigation Request” form provided by the credit reporting agency with each report. Credit reporting agencies must investigate the challenged items within 30 days and must forward all relevant information about the dispute to the party that furnished it, 15 U.S.C. § 1681 i(a)(1). If the furnisher of the information cannot verify the account as correct, it must be deleted from the consumer’s file. When the investigation is complete, the credit reporting agency must provide the results in writing with a corrected report. Returning momentarily to the theme of bad science fiction, years ago was an almost unbelievably bad made-in-Japan television show called Space Giants. The show featured the exploits of Goldar, a 50-foot robot, and his electronic space family. Among Goldar’s manifold enemies were the Lugo-Men. Clad in black leotards, the Lugo-Men’s main occupation was to launch brief, abortive attacks on Goldar’s family. Their chief weapon was a style of kung-fu that would have gotten you beaten senseless on any decent playground. Making matters worse, the Lugo-Men could not be killed, only melted into something that looked like blackberry jam. Inevitably, they would reconstitute and return to harass Goldar and company once again. False items on a credit report are like the Lugo-Men. Things that are seemingly wiped out for good have a nasty habit of reappearing. Therefore, it is extremely important for ID theft clients to periodically order and examine their credit reports to ensure that these items do not come back to life. Getting back to Body Snatchers, recall that the movie ends with Dr. Miles Bennell’s telephone call to the FBI. The question of whether his story of the “Pod People” will be believed by the authorities is never truly answered. Just like Miles, in case of ID theft, your first priority is to provide warnings—to the credit reporting agencies, to the creditors and to the debt collectors. When credit reporting agencies, debt collectors and creditors ignore these warnings, they may have significant civil liability to your client under the FCRA, FDCPA, Truth in Lending Act or whatever common law theories you are clever enough to allege. Maybe, if you are lucky, the “pods” in your case will bear fruit of a greener kind. Dispute information in report: Call number provided on credit report or use “investigation request form” provided by Trans Union when you order your report.